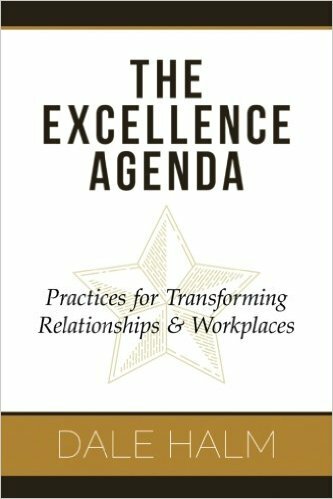 The Excellence Agenda will inspire you to transform your relationships and workplace. Dale Halm Consulting, LLC is a boutique management consulting firm specializing in executive coaching, leadership training, and organizational effectiveness. By applying best practices from the behavioral sciences, we enable our clients to remove barriers and achieve new levels of success. Common issues we resolve include: ineffective leadership, inter-team conflict, dysfunctional culture, unproductive meetings, communication problems, mismanaged change, and lack of alignment on organizational priorities. We help individuals and organizations reach their goals by expanding people’s capability to excel. Clearly understand client needs and identify specific objectives and outcomes. Design and develop customized solutions vs. offering off-the-shelf programs. Deliver practical solutions resulting in improved client capabilities and performance. Evaluate the impact of services provided and determine next steps. Proven, passionate professionals, committed to excellence. Coaching individuals and consulting with a broad spectrum of businesses. Transformative training that results in effective behavior change. Discover what our clients are saying about the value we provide. Dale Halm is the Founder of Dale Halm Consulting, LLC. He has held multiple leadership positions for a Fortune 50 company and has worked with IT, Marketing, Quality Control, Manufacturing, Engineering, and Supply Chain organizations.